Still good, but it loses some of the detail around her eyes. 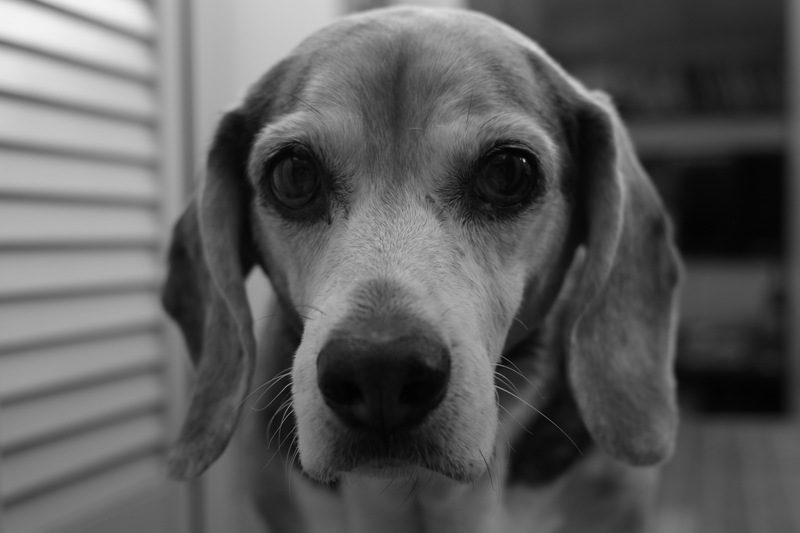 The exposure was correct for the overall shot, but because she is backlit, I should have adjusted the metering mode to assess the exposure specifically in the area near her eyes, the focal point of this shot (although I think the beagle nose is cute, too). See, I learned something already! And, I still got a pretty good photo, even if I didn’t accomplish what I intended. For those of you wondering, the snow started here in southern CT around 7am and began accumulating rather quickly. The wind is beginning to pick up and we probably have three to four inches, but if the forecast is correct, it will all continue to get worse through the night. Sigh. On the bright side, we are well stocked with snacks and lots of really good beer. Thank goodness for really good beer 🙂 Snow…. Booooo… stay warm and safe in the storm! p.s. forgot to mention how much i like the picture ! Thanks! Good beer may not fix everything, but it almost always helps. Snow…Boo! Indeed! Hoe can you go wrong with that subject? However I do see the difference exposure makes. Beer does make us happy, says Ben. Usually, but I have a snowbird beagle so she’s a little less enthusiastic. She also doesn’t know she’s a dog. Thanks for the comment.